Ever wondered what it would be like to become a Shadowhunter? To walk through the streets of Alicante? To visit the Hunter's Moon in New York? Learn about Demons, the History of Shadowhunters, Weapons and fighting at the Shadowhunter Academy in Idris and maybe you'll turn out to be just as good a Shadowhunter as Jace Herondale, Alec & Isabelle Lightwood and Clary Fairchild. What's available on World of Nephilim? 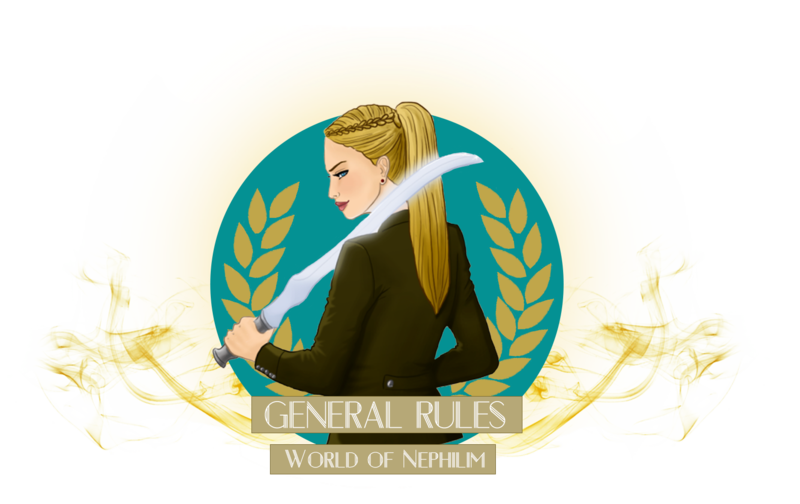 Everyone on World of Nephilim has one interest in common: Shadowhunters. Whether it's the tv show, the movie or the books we all love Cassandra Clare's works. You will immediately get to know other new fellow Shadowhunter fans and will most certainly form lots of unique friendships. Who knows, maybe you'll even find your new best friend at the Soul Ceremony. Enjoy yourself in the chat and write about whatever you desire. What did your Nephilim friends do today and did you hear the latest gossip? Let your character unfold in the Dining Hall or perhaps have a date at the Hunter's Moon in New York? Everything is possible in topics and is (almost) only limited by your imagination. Get the most angelic achievements and show them off to your friends. Gain experience and level up and discover new functions on World of Nephilim. The higher your level is, the better a Shadowhunter you are. Shop in Idris or New York! Are you thirsty? Get yourself some Chamomile Tea at Blackthorn's Bed and Breakfast. Or how about showing off your sense of fashion with new clothes from Magnus Bane's Clothes? Learn Latin and study Runes, or submit a beautiful painting you've created at The Arts class. You can enroll in more than 10 different classes. You have to be at least 15 years old to be a part of the site. If you are under the age of 15 you will be banned. You always need to keep a respectful tone on World of Nephilim - both in the topics, as well as in mails, the chat, and posts. Bullying in topics is, therefore, also not allowed, unless arranged by all involved parts with everyone keeping a realistic attitude towards the situation. It is not allowed to roleplay as other characters than one's own user. You can keep NPCs (Non-Playing Character) as supporting characters. A supporting character is a person or creature with a minor role that can be controlled by everyone within the topic. For instance, a bartender, Demon and more. These need to be viewed from the point of your own character. You can only roleplay as another person, when the Plot-team specifically offers you a role in an ongoing plot, in which case you need to disclose this in an OOG message when you enter the topic. NPCs and other roles can't be other users of the website, the books, movie or series. Any encouragement towards illegal activities is prohibited pursuant to European laws. One needs to be realistic as a character, both on the profiles, in topics and elsewhere. This means that it is not allowed to be Vampire or Half-Faerie (for instance) without having received that status. If you want to read more about this, read the Statuses page in the Guidelines. The character can have a persona, but it can't be exaggerated, for instance saying that the character can lift 1000 kg or that the character can float through the sky. The Consul, Inquisitors and the Leader of Illustrations own all rights concerning the illustrations. If you are not an appointed illustrator for World of Nephilim you are not allowed to distribute copies of the work specially made for WoN to the public. May this be for sale, rental or lending, and/or to display the image without the permission of Vienna Carrington. Some of the items were inspired by designs found on the internet, but the illustration is always unique and drawn by us. It is against the rules to copy or use any codes you may find on World of Nephilim. All codes from user’s profiles have been created by or for that user, these cannot be copied and/or used without the user’s permission. All other codes found on the site (for instance: frontbox, clubs, the archives, lessons, profile texts, and backstory codings) that belong to the authors, admins, and creators of World of Nephilim are also not to be used without permission of the rightful owner. Further action will be taken by the World of Potter Admin team if codes from the site are used without consent. Furthermore, it is appreciated that ideas created on this site are not taken without asking for permission. It takes only a small amount of time to ask, but shows a great act of politeness. Rules are subject to change at any given moment in time. For any questions or suggestions please contact Vienna Carrington.